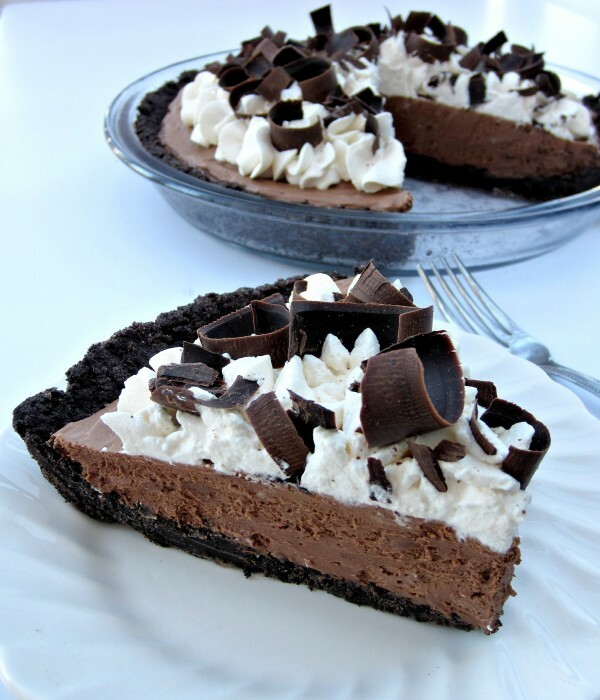 The Perfect Chocolate Pie! 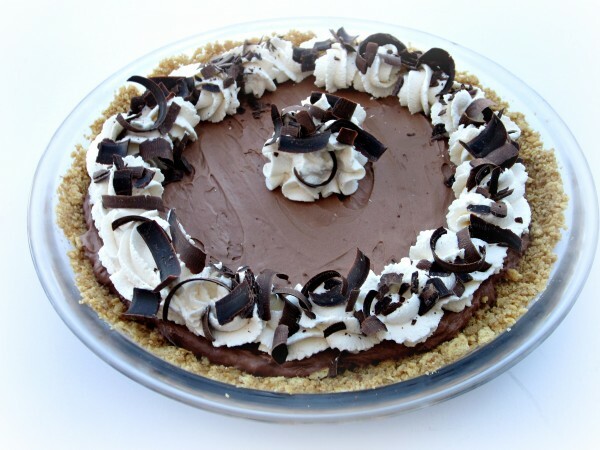 Smooth, creamy and thick you will be in chocolate pie heaven with every bite! 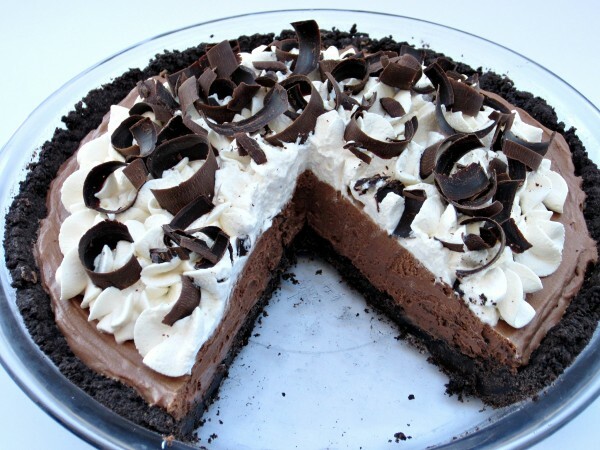 I LOVE chocolate pie!! Growing up it was the only pie I would eat. 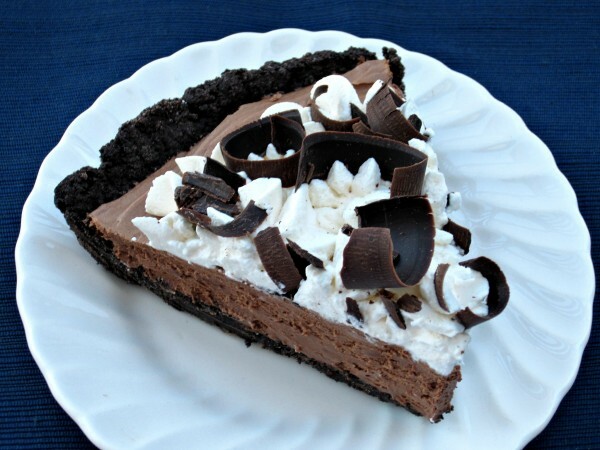 Now I like most pies but if chocolate pie is an option there is no question that is the piece of pie I will have. I can’t even begin to tell you how excited I am to share this recipe with you! 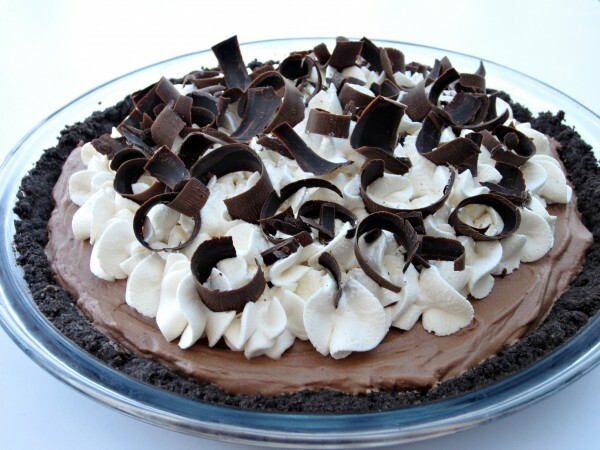 I have been searching for the perfect chocolate pie recipe for over a year now! Last Thanksgiving I almost made the perfect chocolate pie but the chocolate filling was more like the consistency of pudding. I wanted something thicker. So many times since last year I have searched for the perfect chocolate pie recipe. 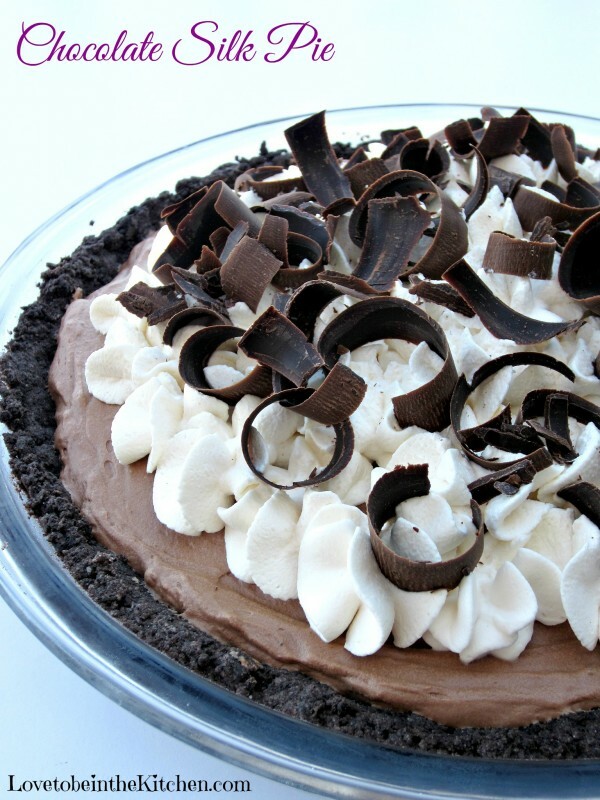 I wanted my perfect chocolate pie to have an Oreo crust, thick chocolate filling, whipped cream and chocolate curls on top. I can’t tell you how many times I spent searching everywhere on the internet for what I had in mind and nothing was what I wanted. The main problem was either the chocolate filling was more of a creamy pudding like texture or it had raw eggs in it. And I don’t eat raw eggs. Pregnant or not. This past Sunday I had an early Thanksgiving dinner with my family. Since I have such a big family- 8 kids, I’m the youngest, all are married and most have children -not everyone will be here for Thanksgiving. I really wanted to bring chocolate pie so I set out on a serious search on the internet and I FINALLY was pretty sure I found the perfect recipe thanks to Annie’s Eats! Her recipe calls for eggs but you put it in a double broiler along with sugar and water so the rawness cooks out and the mixture thickens. She made hers with a pie crust. If you want to do that instead of an Oreo crust follow her instructions here. I have included a recipe for my favorite graham cracker crust at the bottom of this post. That is so delicious too! I used her recipe for the chocolate filling and came up with my own for the whipped cream topping. It’s amazing guys! I made this pie on Saturday and brought it to the family get together on Sunday. I was so excited to try it! It looked perfect but would it taste perfect? I took one bite and was so happy! YES IT WAS PERFECT! An amazing Oreo crust, thick rich incredibly yummy chocolate filling, yummy whipped cream on top and pretty chocolate curls on top. Mmmmmm And not only did I love it but everyone else did. It was gone in a flash and I got a lot of compliments for it! 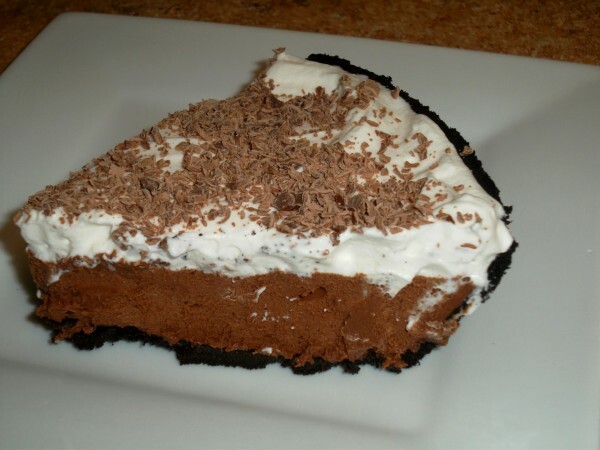 I’m so glad my search is over and now I have this amazing chocolate pie recipe. I for sure will be making this at least every Thanksgiving! I love the look of the cut pie! You can either spread on the whipped cream or pipe it on. Whatever you prefer! Such a gorgeous and yummy pie. To make the chocolate curls I took a small block of chocolate (I buy mine at WinCo) microwave it for 10-30 seconds until it’s soft enough that when I use a vegetable peeler on the side the chocolate peels off into pretty curls. I hope you try it. Your family and friends will love you and fall in love with this pie. It’s amazing! Preheat oven to 350 F. Place Oreos in a zip lock bag and smash until crushed into crumbs or use a food processor. Mix Oreos and melted butter in a bowl until well combined. Add half of crumb mixture to each pie pan. Press into the bottom and sides evenly. Bake for 8 minutes or until hardened. Let cool before filling. Add the cream to the bowl of an electric mixer. Whip on medium-high speed until stiff peaks form. Transfer to a small bowl and refrigerate. Combine the eggs, sugar and water in a heatproof bowl set over a saucepan of simmering water (the water should not touch the bowl). With a hand mixer on medium speed, beat until the egg mixture is thickened and reads 160˚ F on an instant read thermometer, about 7-10 minutes. (If you don’t have an instant read thermometer I recommend just having it over the heat for 10 minutes and you are good to go.) Remove the bowl from the heat and continue to beat until the egg mixture is fluffy and cooled to room temperature, about 6-8 minutes. Add the melted chocolate and the vanilla to the cooled egg mixture and beat until well blended. Beat in the butter 1 tablespoon at a time until well combined. Using a spatula, gently fold in the chilled whipped cream until no streaks remain. Transfer the filling to the two Oreo crusts. Refrigerate until set, at least 3 hours. Chill the bowl and metal whisk or beaters in the freezer for about 15 minutes. (This is not required but recommended.) Pour the heavy whipping cream in the chilled bowl. Whisk until soft peaks form. Add in the powdered sugar and vanilla extract. Continue whisking until stiff peaks form, be careful not to over mix. Before serving pies evenly spread out whipped cream on top or pipe on. Garnish with chocolate curls if desired. Okay, so I was wondering if I could make it the day before and it looks like that’s what you did. Did you just put the whipped cream and curls on the day of eating? I’m thinking I might make this for Thanksgiving. Ooo! I’m jealous! I wish so bad I was making this for Thanksgiving this year but my sister requested my apple crumb pie (which is delicious too!) You can make this a day or two before (keep it in the fridge) and just before serving or up to a few hours before serving, top it with the whipped cream and chocolate curls. I hope you enjoy it and have a fabulous Thanksgiving! I pinned this recipe so I can make it. This looks so wonderful!!! Wish I had a slice right now. Thanks for pinning! I wish I had a slice right now too! 🙂 lol I can’t wait to make this pie again. It’s my favorite! Can you freeze one of these? I have never tried but I think it would work! Wait until the pie is completely chilled then wrap it tightly and well in plastic wrap. If it fits in a gallon zip-lock bag I would do that and get out as much air as you can. Then I would say to eat it within 2-3 months. Please let me know how it goes if you try it! Do you take the creme out of the Oreo’s? Or leave it in? Just leave it in. It blends in with the Oreo crumbs so you can’t see it. Enjoy!